The above quote comes from a post from ‘Tony’s Musings’ Blog about ‘Jersey Workers uprising in May’ during the year of 1847. This information has come from accounts of Norman Le Brocq’s that Tony has transcribed. I have a few shipwrights in my family during the 19th century. This is a time when Jersey became one of the largest wooden shipbuilding areas in the British Isles building over 900 vessels around the island. You can see in the list below that my ancestors were working as ‘Shipwrights’ or ‘Ships Carpenters’ from 1851 to 1891. So now I am trying to find out more about what the actual job entailed. I am also keen to find out where exactly all the shipbuilding yards were or still are in Jersey that my ancestors may have worked in. Philip Le Breton (b.1838) – Ships carpenter in 1861. Philip is the brother-in-law of Isaac W. Davey (born 1851). www.jersey.com – Click here to find out more about Jersey’s Maritime Heritage including the Cod Fishing Trade and life at sea for the Jersey Seaman. Maritime Museum – Click here to find out the opening hours, admission costs and directions if you are planning a visit to the Maritime Museum. This is a great place to take children as many of the exhibitions are interactive and very ‘hands on’! 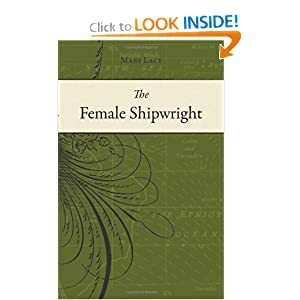 ‘The Female Shipwright‘ was originally published in 1773. It is an autobiography recounting one woman’s life on the high seas — while disguised as a man. Lacy ran away from home at 15 and found employment as “William Chandler,” first as a servant aboard the Sandwich, a 90-gun ship, and eventually as a shipwright with the Royal Navy.